Plumber Los Angeles, CA | Plumbing Contractor, Emergency Plumber, Installation Tarzana, Reseda, Encino, Woodland Hills & Pasadena, California - Home Improvement Services, Inc.
Click Here to Schedule a Service Request! Welcome to Home Improvement Services®, a full service plumbing service contractor providing quality services to residential and commercial plumbing customers in Los Angeles, CA and the surrounding region including the cities of Reseda, Tarzana, Pasadena, Glendale, and the Greater Los Angeles Area. We carry out all of our work with exceptionally high standards of workmanship at prices both reasonable and consistent regardless of the day, night, or after hours work involved. 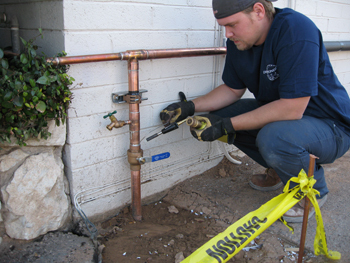 We provide a host of value-packed, honest, professional, and quality plumbing services. Home Improvement Services® is at your service for any same day and after hours needs. We pride ourselves on our response times to service calls, getting your plumbing problems fixed quickly at any time of day and night. When you call us, your service call will be handled by our staff who have been trained to serve your immediate needs and understand the stature of your call, all service calls after hours and weekends will always be handled by a live voice and dispatched to a supervisor for immediate call back. This ensures an immediate confirmation to the customer of a time of arrival and any phone assistance that we can provide. We understand that plumbing problems do not shut down "just because" it is midnight on a Sunday, which is why we have multiple service trucks available around the clock. A shift supervisor after hours handles the calls and dispatches them to technicians; this ensures that all calls are being attended to no matter what the time of day. Pricing and budget always being a concern is something Home Improvement Services, Inc. have prided themselves on being consistent for having a cost efficient rate that stays the same nights and weekends with never any trip, after hours or overtime charges. A complete price sheet for repairs in plumbing / drain cleaning / air conditioning and refrigeration displays the price rate outline, and for commercial plumbing please call for a referral list to find why so many accounts utilize our service.